... in the rooms of Haus Seeschwalbe. Are you yearning for a hotel room with generous ambience? Are you looking forward to beautiful sunsets from your own private balcony? Or are you on your feet all day and your main desire at night is a comfortable bed to rest in? No problem! Our rooms as well as our apartments have something in store for everybody. In our rooms, comfort matters most. Of course, all rooms are equipped with a separate bathroom (shower/WC, hair dryer), flat screen TV, telephone as well as free Wi-Fi. During your stay, you will constantly be in close proximity to nature – whether you prefer the beach, the tideland, the dike or our very own garden. You need extra sleeping space? Just ask for additional bedding during your booking – also available for children. We would love to assist you! We recommend arranging a travel insurance in case of cancellation. We are proud to present to you the gem of our house! The exclusive studio includes a roof patio and spans 50 square meters. Its stylish furniture and high-end technical features make it stand out. Set sail: Enjoy the stunning view from two south-facing balconies complete with deck chairs and a roofed wicker beach chair. The living area features a spacious seating area and a comfortable wing chair, perfect for unwinding, relaxing or reading. Our large flat screen TV comes with a Dolby Surround sound system and gives you an authentic cinematic experience. Mix your own drinks at the mini bar or enjoy the complimentary bottle of wine. By the way, the sleeping area comes equipped with an additional cable TV. Another highlight is the gentle rainforest shower, turning your morning routine into a wellness experience. Included in the price are complimentary welcome drinks, breakfast buffet, coffee maker, the daily newspaper, bathrobes and free admission to the thalasso therapy center “ahoi!“. To conclude your vacation in a relaxed way, the Dream Studio is available to you until noon on your day of departure. 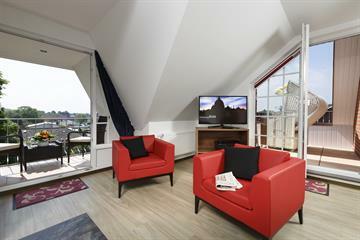 Relax in style on your North Sea vacation. Our lofty 37 square meter Seeschwalbe studios are ready and waiting for you. The studios cleverly combine living and sleeping areas, and a majority of them offer balconies with a view of our beautiful garden. The perfect spot to enjoy the healthy sea air along to some gentle sounds from your in-room stereo system. A complementary welcome drink is included and the daily newspaper is delivered straight to your door. Of course, you can always purchase drinks from your studio’s mini bar. Seeschwalbe studios are equipped with everything you need for a relaxing vacation at the sea – whether you are travelling alone, with a partner or the whole family. We will happily provide you with an extra bed for toddlers or additional people. As a guest in one of our studios, you enjoy free admission for the water park “ahoi!“ that includes a spa and sauna facility. We also provide you with bathrobes and umbrellas, if required. On your day of departure, you can occupy the studio until noon. Do you prefer the comfort of a spacious room? Would you enjoy having a balcony or even your own patio? 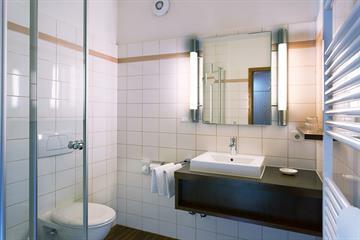 In this case, we recommend our quiet comfort rooms with attached south-facing balconies. Are you travelling by yourself, with a partner or your family? In that case, the comfort rooms with south-facing balconies are a perfect fit. With their 25 to 30 square meter floor plans, you can make yourself at home and enjoy all the amenities. After a day trip or a walk on the beach, choose to have a siesta from your balcony, patio or our adjacent garden. You receive the daily newspaper every morning. And should the weather not be on your side, you can make use of your free admission to the indoor water park “ahoi!” On your day of departure, you can take it easy. The room is yours until noon. Listen up, couples! After an eventful day by the sea, our 24 square meter rooms with balcony are the ideal place to retreat and refresh. Look back at the day’s adventures while unwinding in the cozy seating arrangement on the balcony. Looking south, you will see our blooming garden, and in the east, you can watch the sun come up. 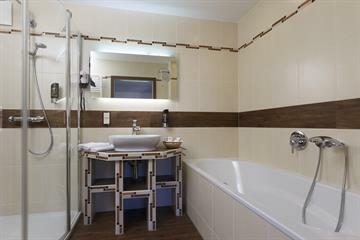 As a guest of this room, you can visit the thalasso therapy center “ahoi!” at a discount. Pure relaxation. A view of the North Sea and a fresh breeze in your face! 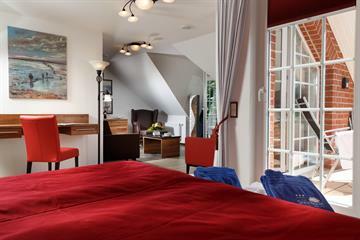 Our beautiful North Sea double rooms face north, giving you a great view of the water’s edge. There is no better way to start your day. 22 square meters of living space allow you to make yourself at home and make plans for the days ahead. Maybe they include a visit to the nearby thalasso therapy center “ahoi!” at a discounted fee? Are you travelling with a child? We will gladly provide extra beds for toddlers. As the individual rooms vary in terms of floor plan and furnishing, please approach us directly. We will find a solution that best fits the needs of you and your family. Take a break in one of our comfort single rooms and enjoy the view from your own balcony – with our refreshing welcome drink in hand. In your comfort single room, you can leave behind your busy everyday life and still remain up-to-date with the daily newspaper that is delivered right to your door. Another complementary feature included in the price is the indulgence program at the thalasso therapy center “ahoi!” free of charge. On your day of departure, the room is yours until noon. Do you prefer a view of the sea or a balcony facing our courtyard and garden? The choice is yours! Whichever you may pick, one thing is for certain: Our lovingly furnished single rooms are your hub for your daily vacation adventure. 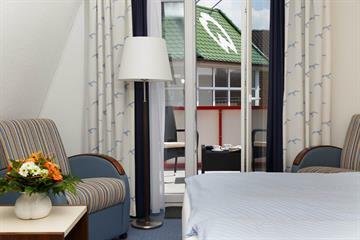 In case you have some spare time, we highly recommend a trip to the nearby water park “ahoi!” Guests of our single rooms visit at a discounted fee.